We thank you, Lord Jesus, for men like Onesimus who were willing to give their lives for their faith. We pray, Lord, that Onesimus and St. Paul and all the saints in heaven will pray for us that we also may be strong in our faith and always ready to be put to the test. Amen. 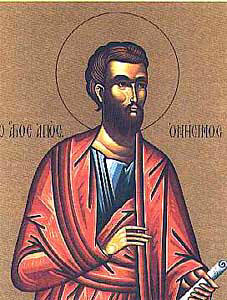 St. Onesimus is an early Christian martyr. He first makes an appearance in St. Paul the Apostle’s Epistle to Philemon. The Apostle crosses paths with Onesimus while incarcerated. There we find out that Onesimus is a slave to Philemon, Apphia, and Archippus. Philemon is a very active Christian. Upon Onesimus’ release, St. Paul sends an letter to Philemon via Onesimus. In the letter, St. Paul urges Philemon to release Onesimus as his slave because, the are both brothers in faith, and as such, brothers should not enslave one another (w. 1.15-16). Philemon does so, and as a result, Onesimus becomes somewhat of a traveling evangelist and ultimately a member of the clergy. Onesimus was then consecrated to the episcopate and succeeded St. Timothy as the Bishop of Ephesus (currently, the Ecumenical Patriarchate of Constantinople). As many 1st century Christians, St. Onesimus was martyred in the year 90. In reflecting on St. Onesimus, one has to be inspired. He went from being a slave, to prisoner, to evangelist, to Bishop. This is only possible by the power of God. One can assume that along the way, St. Onesimus must have had some bad days. Some days in which he did not think that he would make it. But through all that, he still persevered and held on to his faith. As we continue this walk and journey with Christ, we will hit bumps in the road. I know I did and will continue to do so. We must continue to hold on to God. Hold on to him via Bible reading, prayer, fellowship and partaking in the Holy Sacraments. It is essential to growing in Christ. Our growth in Christ then allows us to listen more clearly to what is being communicated to us.